Cross Country Team Goes to Kanchanaburi! This first quarter at Grace International School has been full, and was highlighted by a recent trip to Kanchanaburi, east of Bangkok, to give our varsity cross country team a competitive running experience! I was honored to coach these 14 boys and girls through a short season that lead up to a race against 10 of the top international schools in Asia – 7 of each schools’ fastest boys and 7 of their fastest girls. We knew going in that the competition would be intense, the course would be tough, and, coming from a small school with a young team, we would be greatly challenged. 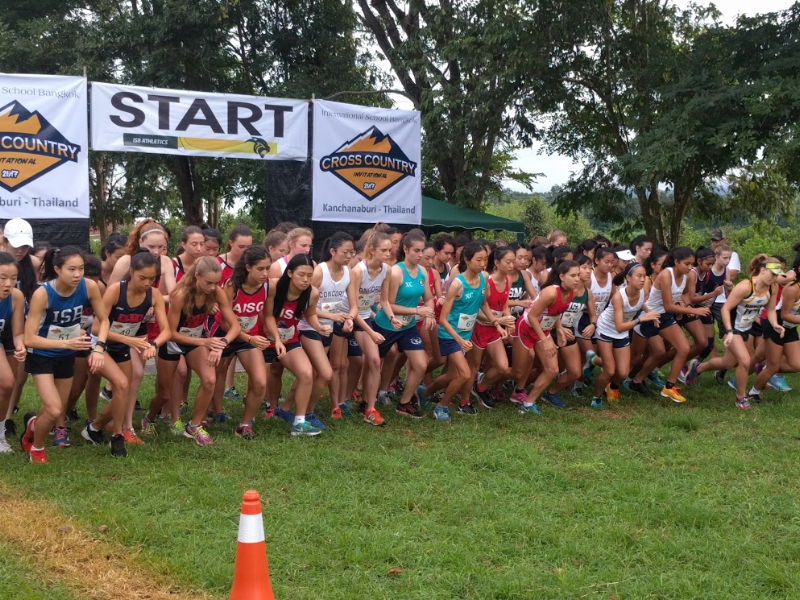 Among the few international schools in Chiang Mai our team has held high rankings in cross country for years, so the opportunity to face higher level teams was just the competition our students wanted and needed. Additionally, this was a big deal to our students because it gave them an opportunity to travel with their teammates. It was a short flight to Bangkok and a 5-hour drive to Kanchanaburi. Every one of our students gave everything they had and even surprised themselves. Instead of being nervous or intimidated by the other teams’ intense warm-ups, our students were calm and focused as we went through our warm-up, and prepared for the task at hand. I think they were more excited than anything! They had never seen a course like this, a race organized this well or competition this good. Our top girl – a junior in only her second year of running – finished 7th out of 70+ female runners and only about 30 seconds behind 3rd place! Our top boys finished 20 and 21 out of 70+ boys. Further, the race was only one part of the weekend trip. The post-race afternoon all the runners were split up into mixed-school teams to participate in a low-ropes challenge course. This was a truly great experience for them and very encouraging (and fun!) for us coaches to watch. We were all very impressed with the behavior of our Grace students. Our students were courteous, considerate, on-time, cheered each other on as well as cheered the other teams on, participated in all activities, and made new friends. From the moment we arrived at the airport until they dispersed when they arrived back in Chiang Mai, the Grace students did reflect and honor Christ with their behavior. This trip was an incredible opportunity for our students. It challenged them in myriad ways and, hopefully, will inspire them and other students to aim high and train hard to reach their goals – not only physically but spiritually.